The suburban area of Perungudi provides its residents with the best of both worlds as it is strategically located between the breathtaking Perungudi Lake and the happening Old Mahabalipuram Road. This spectacular location is just a quick 10 Mins from Adyar and is in close proximity to Thiruvanmiyur, the IT hub of OMR and Velachery as well. 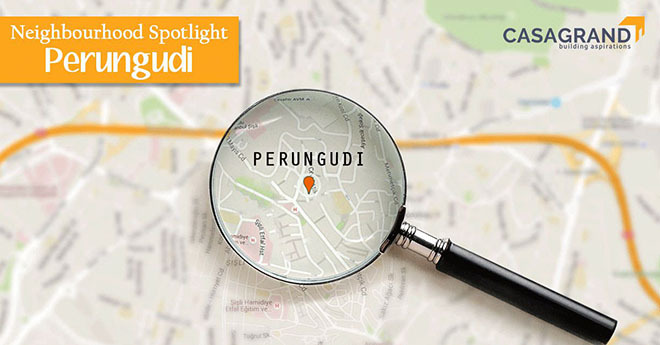 Read on to get a closer insight into the plethora of amenities and facilities Perungudi has to offer. When it comes to authentic South Indian vegetarian food, Hotel Saravana Bhavan is the go-to restaurant for many families. Whether you are planning to indulge in a lavish meal or are just opting for light tasty snacks, this hotel never disappoints. This popular chain of restaurants has its branches scattered all over the happening areas of Chennai and Perungudi is no exception. From scrumptious Arabian food to finger-licking Indian dishes, it the perfect family restaurant for a casual evening dinner. Indo-Chinese is a common favourite in many families and that’s the exact cuisine Wang’s Kitchen has to offer. Take your pick from tasty soups, light momos and mouth-watering rice and noodle based dishes. Paradise Biriyani is one of the best biriyani outlets in Chennai. It offers a multitude of biriyani options from delicious vegetarian biriyani to velvety mutton biriyani which is guaranteed to leave you into a state of euphoria. Subway is an international chain of healthy salads and subs which offers American food at its best. Choose from a variety of vegetables and sauces for your custom-made salad or sub and treat yourself to healthy living. Abacus is an exceptional school which follows the Montessori way of learning. It focuses on striking a balance between academic excellences and inculcating a strong value system in all students. SJRS is a prestigious educational institution which provides kids with the right platform to identify and nurture their individuality and creativity. From recreational activities to inter-house competitions, a bright future backed by SJRS is exactly what every child needs. As the name suggests, BVM Global focuses on providing a world-class education to its privileged students with much-needed psychological and cultural growth. Its high-quality education system boosts every student’s self-confidence and gears them up for a bright future. The KCG College of Technology is a unit of Hindustan Group of Institutions and is affiliated to Anna University. This college offers an abundance of UG, PG, B.Tech and PhD courses and leaves no stone unturned in shaping the future of the youth of the nation. Ragas Dental College is a renowned institute affiliated to Dr MGR Medical University. It has also been recognised by the Dental Council of India and offers a plethora of courses from public health dentistry to oral pathology and microbiology. Waves is your one-stop family shop which provides fun, fashionable and comfortable clothing for individuals of all generations. They even offer festive discounts and have an end of season sale where the trendiest clothes are available at unbeatable prices. Hi-Style is known for its latest designs and reasonable pricing. Its USP lies in its wide variety of segregated clothes for all occasions. From formal office apparels and casual loungewear to trendy college t-shirts and snug night wear, Hi-Style has it all under one roof. Looking for the trendiest pieces of clothing with matching accessories and shoes, all in one remarkable store? Head out to Max and go head-over-heels with their wide variety of stellar and upbeat designs complemented with stylish bags and footwear. Babies and toddlers are adorable in their own cute way. Dress them up appropriately and you have a show-stopper who is guaranteed to grab everyone’s attention. Walk into Babyoye and treat your little one to a multitude of latest styles and cute designs. Apollo is a household name when it comes to multi-specialty care hospitals. Conveniently located at the IT-corridor of Chennai, this branch of Apollo provides world-class health care to its residents across various medical disciplines. ARC is the pioneer in fertility health care. From world-class treatments like IVF and surrogacy to fertility-related services like gynecologic surgeries and stem cell banking, it is your one-stop destination for all fertility issues. Dr Mohan’s is the leading diabetes care provider in India with an extensive reach of over 30 centres across the nation. With top-notch amenities and cutting-edge facilities, it provides its patients with holistic care and state-of-the-art diabetic services. Living amidst these luxurious facilities and well-known brand names is every family’s dream. Whether you are looking for an extravagant villa or a snug apartment, find your dream home at Casagrand with the following ongoing projects and ready-to-occupy projects in the plush locality of Perungudi and the neighbouring locality of OMR.